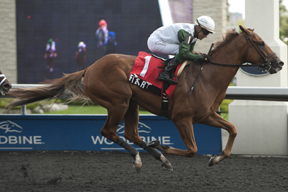 Five Iron took command out of the gate and would not be denied a front-running victory in Sunday’s $153,300 Victoria Park Stakes, at Woodbine. Five Iron, trained by Robert Martin for Fred Allor, came into the 1 1/8-mile ‘Poly’ event off of a third-place finish in the Marine Stakes, a neck behind Victoria Park rival Winning Cause. Winning Cause, sent to post as the 2-5 betting favourite, trailed at the back of the pack under rider Eurico Rosa da Silva, in the compact four-horse field as Five Iron, piloted by Luis Contreras, set splits of :24.87 and :49.15 with Sweet Little Man stalking the early pace. Five Iron led the field into the far turn as da Silva urged Winning Cause into contention looking every bit a winner, but the chestnut lugged in down the lane and could not get past a resurgent Five Iron who battled to a 1 1/4-length victory in a final running time of 1:50.38. Winning Cause stayed on for place over Sweet Little Man. Contreras was pleased with the extra drive offered by Five Iron in deep stretch. Five Iron, a three-year-old son of Sharp Humor, started his 2013 campaign on the green at Keeneland when sixth in an allowance route, on April 10. The chestnut then shipped to Woodbine where he finished a rallying second when sprinting in the Woodstock Stakes, on April 21. His Victoria Park score marks the second victory in nine career starts for Five Iron who banked $93,000 for his front-running score. He returned $6.90, pairing with Winning Cause for an $11 (1-4) exactor. There was no place or show wagering.